I flagged this answer as "Not an Answer" with the reasoning: "Not an Answer since the OP explicitly stated the command initially (so repeating the command to use is not an answer in this case)" because the OP of the original question explicitly stated that was the command they already used. Therefore, suggesting that they may have mistyped the command, or suggesting that they should run that command is not a valid answer. However, @jrg states that it "may be useful to people in the future" in the decline reason. I challenge any moderator (or any other user) to prove this, given that the OP already said they were using the pppoeconf command in their question, which means generally that they were not misspelling the command, thereby making the answer that was flagged invalid. I believe you jumped the gun here. 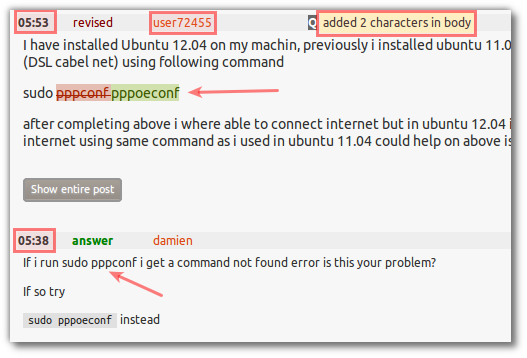 The revision history (and the timeline) clearly show that the OP misspelled pppconf and revised it to pppoeconf only after that answer pointed out the typo. As others have stated, it's also obvious from the comments that once the typo was resolved, a productive troubleshooting session seemed to be beginning. It is a answer, and it might help someone in the future. It is possible (although perhaps somewhat unlikely) that someone finds that question, and that the answer you flagged might be useful to them. And since Stack Exchange (and by extension, Ask Ubuntu) exists to "Make the Internet a better place to get expert answers to your questions", I would argue that since this answer might help someone with a similar problem, it stays. Now, it may be a 'bad' answer for any number of other reasons, including lack of formatting, bad spelling, dead links or anything else that might make it a 'bad answer'. In this situation, either decline message (either my custom one or the stock that I quoted above) would have worked. IMHO - this is the beginning of an answer and investigation between the OP and the answerer. From the comments it looks like the answer is double checking that they are entering the correct command. Its perhaps too early to flag just yet. Let a few days pass. If the "conversation" ends then it may be a valid flag. Remember, questions and answers are only moderated for clear and unambiguous issues. Answers, unless in the moderators expertise are not moderated for their technical content - whether good or bad. Is “internet” a synonym of “internet-connection”?